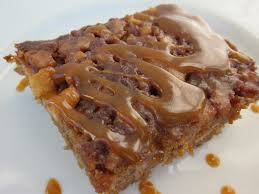 This delicious apple cake with caramel topping is easy to make. This recipe makes a large single layer moist cake. It also freezes well, if you manage to have cake leftover! This recipe was complimentary with the purchase of apples at Creasy Apple Farm. If you find yourself in the Picton area, this is a great place to stop for apples, pears or plums. There are many varieties to choose from, the samples are free and there's always a hard working family member around to guide you in your purchase. For this cake, I prefer to use the ever popular Honey Crisp apple. This variety of apple is aptly named, sweet, crisp and very juicy.That being said, the first few times that I made this cake I just used apples that I had on hand and the cake was a big hit! If you are a novice cake baker, please read the notes at the end of this recipe. Mix the ingredients by hand in the order given. Pour into a 13 x 9 inch pan. Bake in a preheated oven at 350 degrees for 30-40 minutes.Make the topping when the cake has almost finished baking. Melt 1/4 cup of butter in a small saucepan on top of the stove. Add 1/4 cup of milk and 1 cup of brown sugar. Bring to a boil while stirring. Set your timer and boil gently while stirring for 4 minutes. When the cake has finished baking, remove from the oven. Pour the caramel topping over the cake and return to the oven for a few minutes.Remove the cake when the topping bubbles. Place cake pan on a cooling rack.See if you can let it cool completely before you try a piece! Enjoy!! 1.I chop the apples in 1/2 to 1 inch sized pieces. 2. I stir the flour, salt and baking soda together in a separate bowl and then combine with the other ingredients. This so that your baking soda doesn't directly encounter moisture which would render it useless as a leavening agent. 3. There is a generous amount of batter and it is VERY stiff to stir, so I use my largest bowl and a strong silicone spatula. Stir until ingredients are combined. Place in either a no stick Teflon or greased cake pan. Spread evenly with the spatula. 4. To see if your cake is done, check the center with a cake tester or a tooth pick. If you are uncertain about how to do this go here. 5. Watch the heat when making your caramel topping. Sugar scorches easily, and then your caramel will taste burned. I suggest boil carefully while stirring. On my stove top I can boil this mixture gently at a medium setting. Also, set your timer to boil accurately for 4 minutes. This makes the perfect caramel topping. 6. Before I pour the topping over the cake, I pierce the surface of the cake with a tooth pick in several places so as to allow the caramel to penetrate slightly. Then place the cake back in the oven for a few minutes until the topping is bubbling on the cake surface. This great apple cake stays incredibly moist so you will want to refrigerate it after the first day. I usually remove mine from the cake pan in large pieces and place in a covered plastic container in the refrigerator. You can give each piece a few seconds in the microwave before serving for optimum flavor. Hi Lori - Thanks for recommending cookware with Teflon® nonstick coatings while making your Apple Cake with Caramel topping recipe! I represent DuPont and it's always a pleasure to see people recommending our products in their recipes.